The belief that money growth causes inflation still influences economists and policymakers. Using VAR and co-integration techniques, we tested the empirical validity of monetarism as a theory of inflation from 1959 to 2011 in the US. We found that the monetarist theory does not fit the data. More strikingly, between 2008 and 2011 the monetary aggregate grew annually by 10% while the average of inflation remained at 1.3%. Given the lack of a strong relationship between money growth and inflation in the US, this paper supports a theory in which a high increase in purchasing power can generate inflation. With the same econometric technique, we found that this approach does consistently describe the inflation phenomenon consistently. That is, excessive credit can produce a high increase in demand that may not always be followed by an increase in real production, therefore creating inflationary pressures. These conclusions are robust to changes in specification. Under certain circumstances, this approach can be compatible with several schools of thought. *Acknowledgements: The author has benefited from the assistance of Anwar Shaikh and anonymous reviewers, to whom he is enormously grateful. The author is also grateful to the editor. The usual disclaimer applies. There is a plethora of hypotheses for the causes of inflation. Some of the most popular are: increasing the capacity utilization over its normal level (Duménil & Levy, 1999), a decrease in the unemployment rate below the non-accelerating inflationary rate of unemployment (NAIRU) level (Ball & Mankiw, 2002), money growth or the quantity theory of money (Friedman, 1963), fiscal deficits or the fiscal theory of the price level (Congdon, 1987), distributional struggle (Taylor, 1991), and increasing the ratio of investment to “normal” profits (Shaikh, 1999), among others. 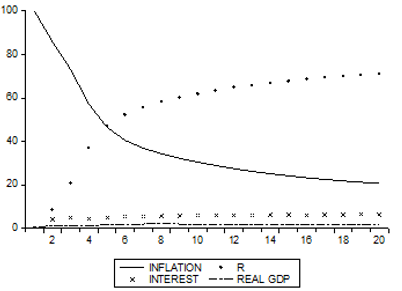 The belief that money growth causes inflation is one of the most influential; it is a theory that is still taught in most undergraduate programs as a validated theory. Moroney (2002), Nelson (2003), and Favara and Giordani (2009) are among the researchers who still support the monetarist view of inflation. Thoma (1994) argues: “The existence of a causal relation between changes in money growth and changes in both the inflation rate and the nominal interest rate is generally acknowledged” (p.218). According to Sargent and Surico (2011), in recent years the monetarist paradigm of inflation has not shown up explicitly in the literature: “…during the last year, unprecedented growth in leading central banks’ balance sheets has prompted some of us to worry because the quantity theory has slept before, only to reawaken” (p.111). On the other hand, Estrella and Mishkin (1997), Stock and Watson (1999), Svensson (1999), and De Grauwe and Polan (2005) empirically found that money growth provides no significant information about inflation. In fact, in the New Keynesian framework, the impact of money growth on inflation is not directly linked, although it can be implicit in their modeling (Gali, 2002). We inquire into the empirical validity of monetarism as a theory of inflation and argue that the recent crisis appears to suggest that monetarism is an empirically irrelevant theory of inflation. This is addressed in the second section through a vector autoregressive (VAR) process, testing the relationship between money growth and inflation. We find a lack of a relationship between money growth and inflation in the US. In the third section, we use modern methods to test the proposal of Shaikh (2016) that an increase in purchasing power created by credit is a better benchmark for inflation. This proposal, which recalls the role of credit, appears to fit the data for the US and is robust to changes in specification. The approach taken in this paper appears to be eclectic because it can be deemed, under certain circumstances, compatible with different schools of thought. It can be linked to the New Keynesian long-term growth path, where output deviations, caused in this case by excessive credit, create inflation. It can be related to a Post-Keynesian theory in which inflation is caused by excessive utilization of capacity (Arestis & Sawyer, 2005), and that excess can be the consequence of a higher purchasing power created by credit. Also, it can be perceived as a refurbished monetarist theory, wherein the central bank pushes inflation through excessive credit easing. Shaikh (2016) argued that this theory of inflation can be part of a Classical approach. However, in this paper there are no assumptions of full employment or stable velocity, and we recognize that there might be other factors affecting inflation at a particular moment (e.g., shocks on import prices). In addition, we do not assume an exogenous money supply or a long-run growth path, and do not limit the effect of credit expansion only to the prices of assets. In any case, the most relevant point of any theoretical insights into inflation might be the ability to be corroborated by the data. where yt‘ = (π, M, i, X), Kp are coefficient matrices, π stands for inflation, i is the nominal interest rate (three-month Treasury Bills), X is real GDP, M is M2, and u is an independent and identically distributed vector of disturbances. We chose VAR as it has many advantages over single equation or structural multi-equation modeling. For instance, here there are no exogeneity assumptions concerning the variables of interest because all regressors are endogenous. Pure exogeneity can be a strong assumption because these variables may present feedback effects; inflationary conditions may lead to money or credit creation. Our results were tested against lag sensitivity. There are different procedures for decomposing the residuals in a VAR analysis. We selected the orthogonal set of innovations constructed by Pesaran and Shin (1998), which provide generalized impulses that are robust to the ordering of variables, although this method shares restrictive identification assumptions with other methods. [i] The estimation of Equation (1) passes the Lagrange Multiplier test for autocorrelation, indicating that there are not major misspecification problems at the 95% confidence interval. where is an estimator of the standard deviation of the numerator (for more detail, see Hansen & Johansen, 1999). In Figures 2 and 6 below, we show the p-values associated with this test of stability. where C is the flow of domestic credit (as defined in IFS, 2014) plus balance in the current account (since negative balances increase the dependency on credit), P is the price level, and e is the error term. C divided by nominal GDP (Y) can provide a proxy for the increase in purchasing power, which can move either the level of aggregate production or the level of prices. This mechanism assumes that output is not always at its optimum but that growth in real output has a sustainable threshold, which can be crossed through high credit expansion. If that threshold is passed, the increase in purchasing power will create inflation. Thus, inflation is predominantly created through a relatively high extension of credit in the system. where Xt‘ = (π, R, i, X), R = Ct /Y(t – 1), and v is the vector of innovations. As stated above, the data on C were only available in years from the International Financial Statistics. Given that the variables in (7) have one cointegrating equation, a VECM as applied following Equation (2). This process was also tested against autocorrelation and stability. At the end of Section 3 we show a forecast error variance decomposition analysis to evaluate the relative relevance of each variable on predicting inflation (for a detailed review of this standard analysis, see Lütkepohl, 2005). The equation of exchange (price level multiplied by real output is equal to the money supply multiplied by the velocity of money) is a plausible identity proposed by classical economists such as Hume and Ricardo. However, it is well-known that monetarists convert the identity into a function by making specific assumptions, such as holding velocity and output growth stable. With these and other familiar assumptions, they conclude that growth in prices is a direct function of money growth. Friedman (1963) could not be clearer: “Inflation is always and everywhere a monetary phenomenon” (p. 17). Let us first test the empirical validity of the monetary theory of inflation. In Figure 1, we show some of the puzzles of this theory by maintaining the convention in these models of only presenting the impulse-response function (Stock & Watson, 2010). Notes: Accumulated responses are shown. Two lags were chosen following AIC, HQC, and SIC. Annual data, 42 observations. There is one co-integrating equation. Dash lines represent 95% bootstrap confidence intervals. When we control for the effects of output and the interest rate, the accumulated responses of inflation to money growth are negative. 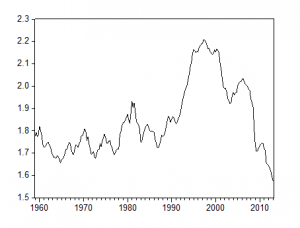 [ii] A stochastic shock in the money growth has a small net negative effect on inflation. It is interesting to note the dependence of inflation on its own past shocks. When evaluating the confidence intervals, we warn the reader that these bootstrap confidence intervals should be interpreted with caution; they are just approximations as for VECMs it is not possible to calculate asymptotically unique confidence bands. The results illustrated in Figure 1 are coherent with the descriptive statistics: Between 2008 and 2011 money grew annually by 11.4%, while the average of inflation remained at 1.4%. As a matter of fact, there was deflation in the second quarter of 2009. Thus, we found a lack of a relationship between money growth and inflation. Friedman’s (1968) assertions do not appear to apply even in the long run, as often argued. These results were robust to different lags and money aggregates and may contest the findings of Favara and Giordani (2009), among others, who found a positive effect of money growth on inflation. That is, Figure 1 illustrates that there is no one-to-one positive relation between money growth and inflation, weakening the one-size-fits-all statement of Friedman. The null hypothesis in this test is that there is stability for the sample considered. 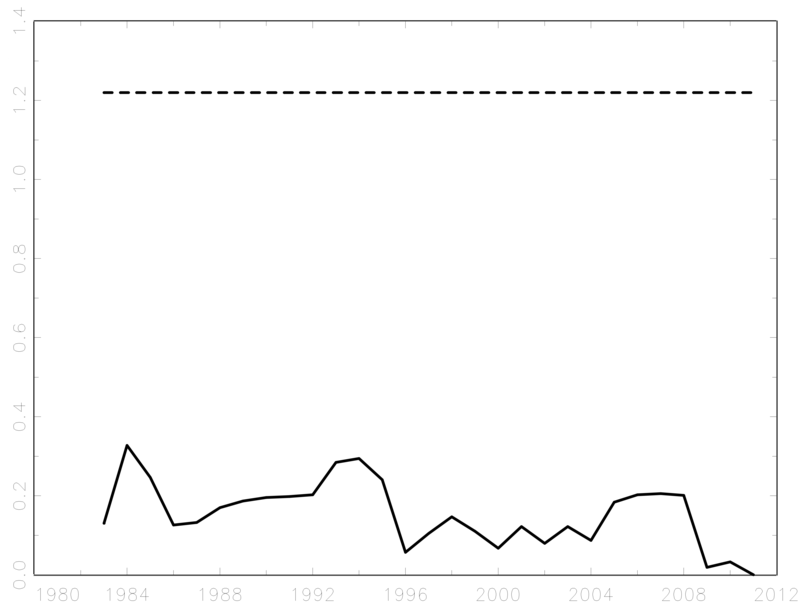 In Figure 2 it is shown that the model is structurally stable except for the years 1991 and 1996, and the period 2008-12. This could be due to the structural changes that occurred in the 1980s, which changed the persistence of inflation and led to declines in the volatility of output and inflation, the causes of which are still debated (for a detail review, see Canova and Gambetti, 2009). Some of the important innovations in this period were the development of new financial products, the emergence of different corporate management (Lazonick & O’Sullivan, 2000), and the increase in financialization and in trade patterns (Milberg, 2008), among others. Notwithstanding the regime changes and its low predictability power in the last 26 years, the monetarist theory of inflation is still popular among neoclassical economists and policymakers. Nelson (2003) argued: “The resulting discrepancies between base growth and inflation are, as argued above, not inconsistent with the AEMP (always and everywhere monetary phenomenon) proposition, and reflect a property of velocity behavior noted by Wicksell a century ago”(p.12). Nonetheless, the monetarist innovations related to the classical equation of exchange were to hold velocity and output stable to induce a one-to-one mapping between money growth and inflation. For instance, Lucas (1996) stated: “The central predictions of the quantity theory are that, in the long run, money growth should be neutral in its effects on the growth rate of production and should affect the inflation rate on a one-for-one basis” (p. 665). The acceptance that velocity is not stable in the long run contradicts the monetarist foundations and supports the arguments of the banking school, among other schools of thought. Figure 3 shows the stability, if any, of money velocity. 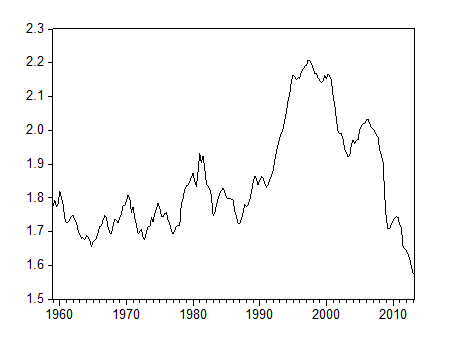 Velocity ceased to grow in a sustained pattern roughly around 1980. Afterward it shows no clear pattern, not even across business cycles; this is an empirical puzzle that undermines the central monetarist assumptions. There are some other theoretical discussions on the reasons for the changes in the velocity of money that are beyond the scope of this empirical paper (Cuthbertson & Taylor, 1990). However, we would like to stress that the monetarist explanations are not currently accurate in terms of either assumptions or predictions. Is there a better approach to inflation? Instead of assuming any pattern of credit, perhaps a better framework for studying inflation would be to quantify the effect of credit on inflation, thus showing if money creation is really a reflex of credit. 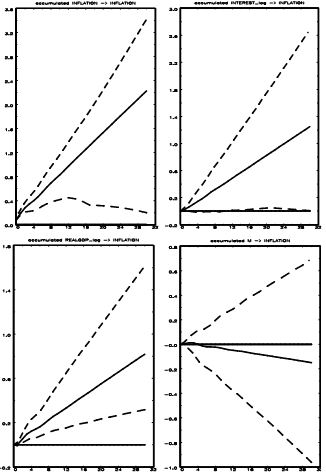 Figure 4 provides more evidence concerning the new patterns of these variables. Notes: Credit equals flow of domestic credit plus balance in current account. Only annual data was found. 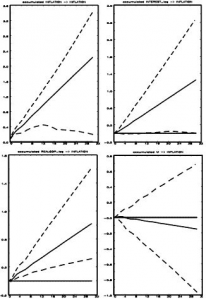 Before 1973 both series exhibited consistent correlation, reflecting that changes in money stock could provide a good benchmark for credit in that period. 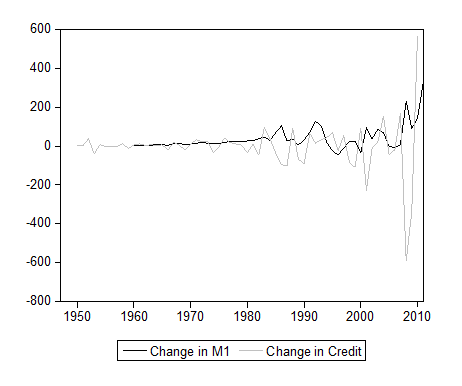 However, after 1973 the two series show¾more than a disassociation¾a strong indirect relation supporting our thesis that money growth does not map credit. A similar pattern is reflected when comparing the growth of the two variables. Observing the differences between money and growth and credit, the immediate question would be: what is the empirical validity of Equation (7)? We show that relationship in Figure 5. An unexpected credit shock appears to have a net positive consequence for the inflation, an effect found even when the regression controls for other factors, such as GDP growth and the interest rate. It would appear that a new and high injection of demand will create inflationary pressure. The confidence intervals remain within a positive range. A high increase in demand can only be fulfilled if credit is extended. Credit represents a demand over savings and over money created. Thus, it is not necessarily determined by supply: if there is no demand for credit, inflation will be low. This is one of the factors missing from the monetarist theory and is a key point in understanding why the recent high increase in the money supply has not created high inflation. Following the same methodology shown above, this research tests the structural stability of the last model in Figure 6. 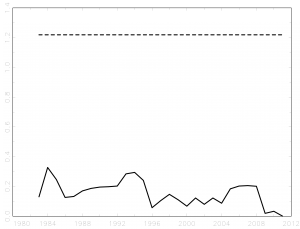 As can be observed, the model was structurally stable at the 10% significance level, except for the years 1996 and 2000 and the period 2009-2012. As in the previous model, there is the possibility that there were changing parameters during the economic crisis, a situation that could be expected given the pronounced distortions of that crisis. However, in qualitative terms our approach remains valid: The credit crunch of the 2008 crisis was accompanied by low inflation. That is, without the help of dummy variables, the model applied in this paper thoroughly stimulates the movements in inflation. Note: We used the concentrated likelihood function. 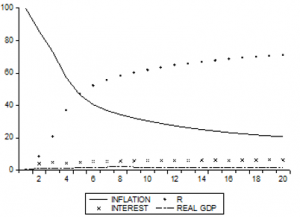 What is the relative importance of the determinants of inflation? Can we say that credit affects inflation more than GDP? Forecast error variance decomposition is a widely used tool that can help answer this type of question. Figure 7 shows the decomposition results for inflation. It is easy to see that our credit variable contributes more to explaining movements in inflation than the rest of the variables. Previous inflation is in general the second variable of greatest influence in explaining the inflation phenomenon. Note: R is the credit variable divided by GDP. The monetarist theory of inflation does not consistently fit the data. We tested for different periods and with distinctive specifications and all the results pointed to money growth not systematically describing the inflation pattern. Stable velocity is no longer observed and money is not a reflex of credit. That is one of the reasons why we found no one-to-one relation between money growth and inflation as Lucas (1996) claimed. On the other hand, changes in credit do describe the inflation phenomenon consistently. Credit provides a better framework for evaluating the consequences of a net injection of demand on inflation. This is because excessive credit can produce an increase in purchasing power that may not always be followed by an increase in real production, therefore creating inflationary pressures. The movements in credit in the form of new purchasing power provide a better framework for obtaining information about inflation. The results shown in this paper are robust to changes in specification, especially when controlling for the effects of output and the interest rate. For neoclassical economics, perhaps it is time to bury Friedman’s paradigm. For other traditions, this eclectic approach provides a more consistent explanation of inflation, which could create a point for some theoretical convergence. Arestis, P., & Sawyer, M. (2005). Aggregate demand, conflict and capacity in the inflationary process. Cambridge Journal of Economics, 26(4), 959–974. Ball, L., & Mankiw, G. (2002). The NAIRU in theory and practice. Journal of Economic Perspectives, 16(4), 115–136. Canova, F., & Gambetti, L. (2009). 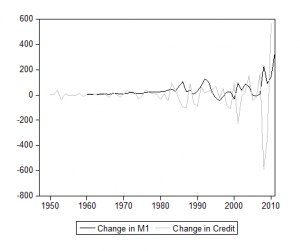 Structural changes in the US economy: Is there a role for monetary policy? Journal of Economic Dynamics and Control, 33(2), 477–490. 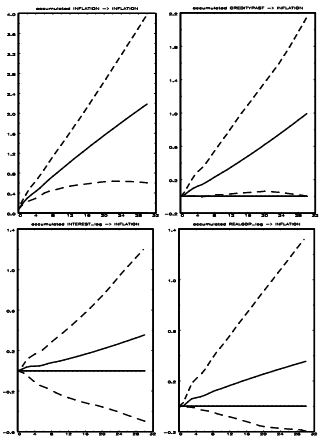 Congdon, T. (1987).The link between budget deficits and inflation: Some contrasts between developed and developing countries. In M. Boskin, J. Flemming, & S. Gorini, (Eds. ), Private saving and public debt (pp. 72-91). New York: Basil Blackwell. Cuthbertson, K., &Taylor, M. P. (1990).The case of the missing money and the Lucas critique. Journal of Macroeconomics, 12(3), 437–454. De Grauwe, P., & Polan, M. (2005). Is inflation always and everywhere a monetary phenomenon? The Scandinavian Journal of Economics, 107(2),239–259. Duménil, G.,& Lévy, D. (1999).Being Keynesian in the short term and classical in the long term: The traverse to classical long-term equilibrium. The Manchester School, 67(6), 684–716. Estrella, A.,& Mishkin, F. (1997). Is there a role for money in monetary policy? Journal of Monetary Economics, 40, 279–304. Favara, G., & Giordani, P. (2009). Reconsidering the role of money for output, prices and interest rates. Journal of Monetary Economics, 56(3), 419–430. Friedman, M. (1963).Inflation: Causes and consequences. New York: Asia Publishing House. Friedman, M. (1968). The role of monetary policy. 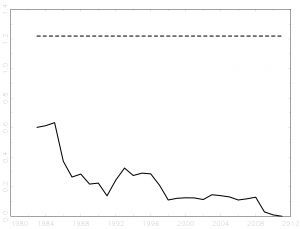 American Economic Review,58, 1–17. Galí, J. (2002). New perspectives on monetary policy, inflation and the business cycle. NBER Working Paper 8767. Hansen, H., & Johansen, S. (1999). Some tests for parameter constancy in cointegrated VAR-models. Econometrics Journal, 2, 306–333. Lazonick, W., & O’Sullivan, M. (2000). Maximising shareholder value: A new ideology for corporate governance. Economic and Society, 29(1), 13–35. Lucas, R. E. (1996).Nobel lecture: Monetary neutrality. Journal of Political Economy, 104, 661–682. Lütkepohl, H. (2005). New introduction to multiple time series analysis. Berlin, Heidelberg, New York: Springer. Milberg, W. (2008).Shifting sources and uses of profits: Sustaining US financialization with global value chains. Economy and Society, 37(3), 420–451. Moroney, J. 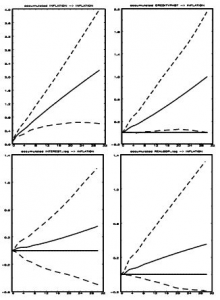 (2002).Money growth, output growth, and inflation: Estimation of a modern quantity theory. Southern Economic Journal, 69(2), 398–413. Nelson, E. (2003). The future of monetary aggregates in monetary policy analysis. Journal of Monetary Economics, 50(5), 1029–1059. Pesaran, H. H., &Shin, Y. (1998). Generalized impulse response analysis in linear multivariate models. Economics Letters, 58(1), 17–29. Sargent, T., & Surico, P. (2011). Two illustrations of the quantity theory of money: Breakdowns and revivals. American Economic Review, 101(1), 109–128. Shaikh, A. (1999). Explaining inflation and unemployment: An alternative to neoliberal economic theory. In A. Vachlou (Ed. ), Contemporary economic theory (pp. 89-112). London: Macmillan. Shaikh, A. (2016). Capitalism: Competition, conflict, crises. Oxford: Oxford University Press. Stock, J., &Watson, M. (1999). Forecasting inflation. Journal of Monetary Economics, 44, 293–335. Stock, J., &Watson, M. (2010). Vector autoregressions. Journal of Economic Perspectives, 15(4), 101–115. Svensson, L. E.O. (1999). Monetary policy issues for the Eurosystem. Carnegie-Rochester Series on Public Policy, 51(1), 79–136. Taylor, L. (1991). Income distribution, inflation, and growth: Lectures on structuralist macroeconomic theory. Cambridge: MIT Press. Thoma, M. A. (1994). The effects of money growth on inflation and interest rates across spectral frequency bands. Journal of Money, Credit and Banking, 26(2), 218–231. [i] The identifying assumptions are consistent when the variance matrix of the reduced form shocks is diagonal. [ii] As data on credit are only available in annual figures, to facilitate comparison between Figure 1 and Figure 5, we use annual data. After all, any plausible theory should provide similar empirical results in years and quarters, and not dependent on the periods.